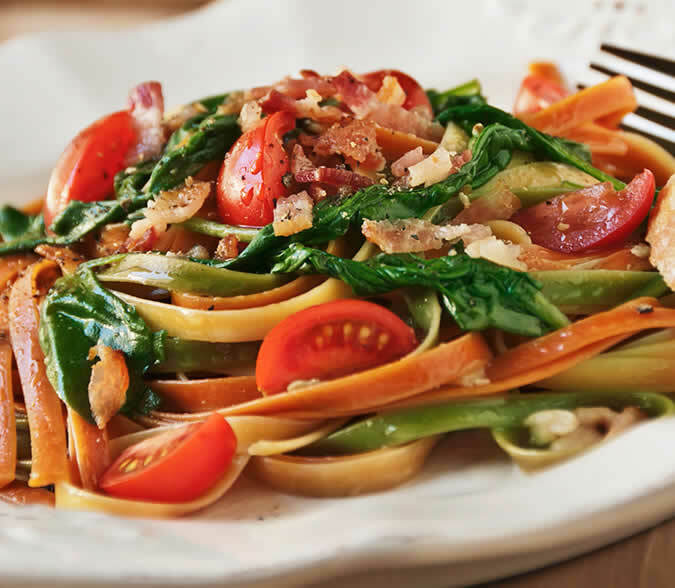 DINNER Your favorite BLT meets tri-color fettucini for a quick and delicious dinner. Just add garlic bread and you’re done. Bring a large pot of lightly salted water to a boil. Add the pasta, and cook according to package instructions until tender, about 8 to 10 minutes. Meanwhile, heat 1 tablespoon of olive oil in a skillet over medium heat. Place bacon in the skillet, and cook until browned and crisp. Add garlic, and cook for an additional minute. Gently stir in the tomatoes, and cook until heated through. Place the spinach in a colander, and drain the hot pasta over the spinach to wilt the leaves. Transfer pasta and spinach to a large serving bowl; toss with the remaining olive oil and the bacon and tomato mixture. Drizzle with lemon juice and season to taste with freshly cracked pepper and Parmesan cheese. Serve.